Chickweed is one of those things most of us have growing in our yards. It can most definitely be seen as a weed in that it grows fast and can take over if left unchecked. Like many wild things and weeds, however; it is full of nutrition and other benefits. 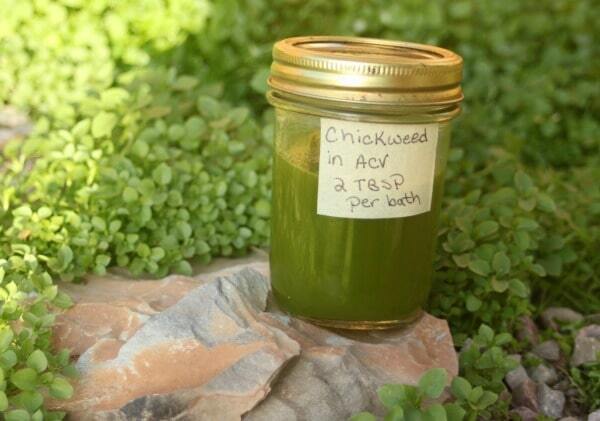 Chickweed has long been used externally to treaty itchy skin and reduce inflammation. If you have itchy skin (and are adequately hydrated internally) and hard water this chickweed bath vinegar might just be the relief you're seeking. This is such a very simple thing to try, it whips up in a hurry and a person would likely know after a couple of uses if it was helpful. Make up a single batch and give it a go before making a huge bottle. Itchy skin can be a sign of many things so this chickweed vinegar may or may not provide relief but as it is inexpensive and so very simple it's worth a try. If it does work, bigger batches to have on hand for winter are easily made and stored. Follow up those baths with some homemade itchy skin balm, too. Harvest a giant handful of the chickweed greens, stems, flowers, leaves, and all. Wash and dry the harvested greens. 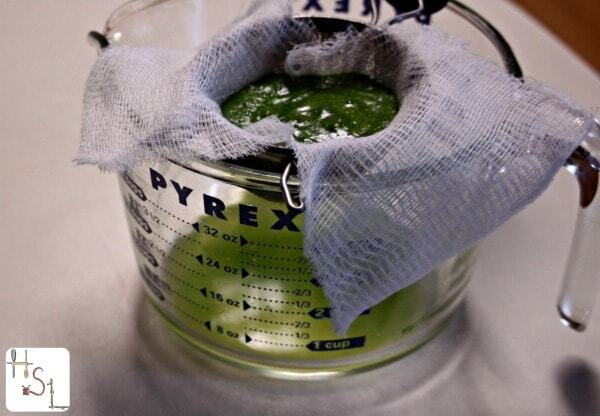 Put the greens in a blender with 1/2 cup raw apple cider vinegar. Purée the greens, if needed add more vinegar. Strain the mixture, keeping only the liquid. Store the vinegar in a glass jar. Simply add 2 Tablespoons to warm bath water. The vinegar is diluted enough that you won't likely smell it on your skin afterwards. The acidic vinegar may also help balance the skin's ph level further reducing the itchy skin. The vinegar will be that lime green shade for about the first 24 hours and then it will change to a golden yellow color. This is perfectly natural and normal, nothing at all to cause worry. 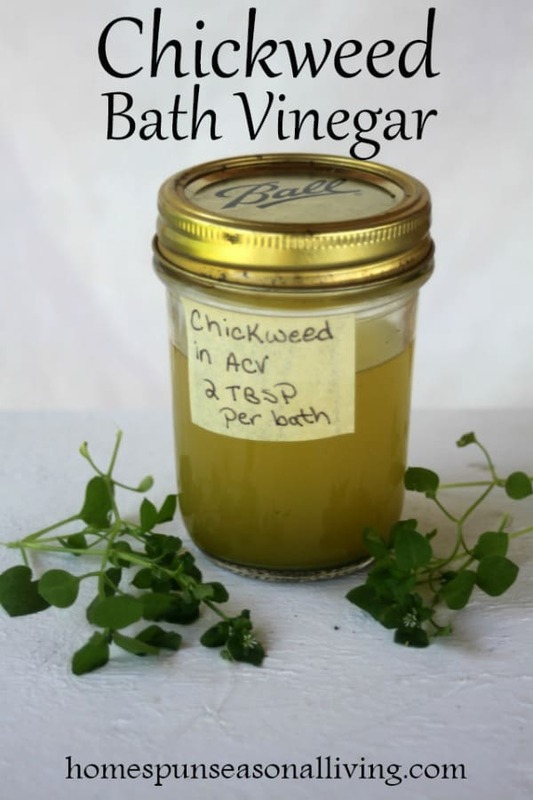 Chickweed produces most of the spring, summer, and fall, so get out there and try a bit of this bath vinegar now and harvest more later to the last through the winter. Is this recipe safe for dogs? It should be fine for external use on dogs. I made jewelweed vinegar too. Do you think it does the same trick? I imagine it could – jewelweed is so great for itch. I would use it up within 1 year. Vinegar is a pretty great preservative. Do you know if this could be used internally? Cider vinegar is good for alkalizing the body..the chickweed full of minerals..hmmmm It sounds possibly like a good tonic to me. I’ve never taken it internally but I don’t see why you couldn’t. It’s all completely edible and chickweed is supposed to have a cooling effect on the body when taken internally… the one caveat is that it can have a laxative effect when taken in large quantities. Maybe just take a Tablespoon or day to see. What are you hoping its effects might be?